White asparagus season is in full swing! Like black truffle, hairy crabs or even durians, the season matters if you’re looking to savour the best of white asparagus. As Europe celebrates the arrival of Spring, these cream coloured legumes are at their sweetest and juiciest. 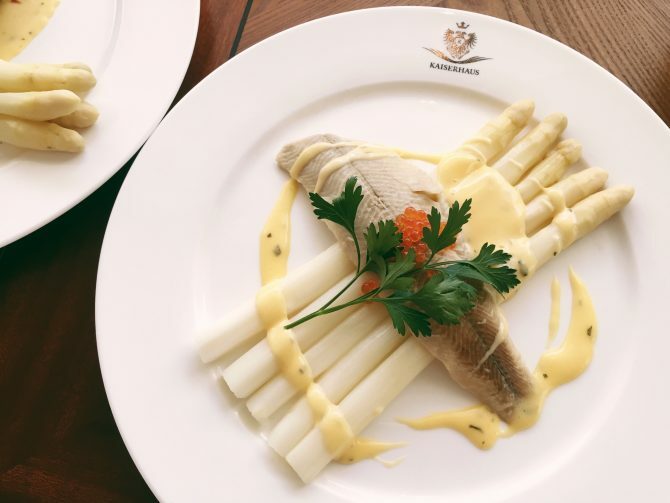 At Kaiserhaus, white asparagus season is in full swing with a special menu available from now till June 5. 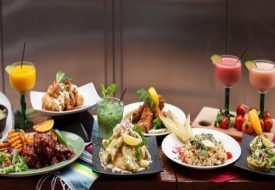 The restaurant, which specialises in Central European cuisine, has unveiled a menu featuring one soup and four mains. It is also one of the few restaurants here with white asparagus air flown from Austria. The Spargelcremesuppe (Cream of White Asparagus Soup) with smoked ham is smooth and creamy. Did you know that the white, naturally sweet and nutty tasting legume, comes from the process of etiolation? What this means is that dirt is kept mounded around the emerging stalk, depriving it of light. The plant, affectionally called the ‘vampire’ of the vegetable world, cannot produce chlorophyll without light, thus the stalks emerge white. Now that you know why these beauties are white, be sure to savour them the right way. At Kaiserhaus, the Spargel Klassisch (White Asparagus Classic, $28) is a great choice for those who prefer a light meal. A boiled bundle of white asparagus is served with parsley potatoes and Béarnaise sauce. Each mouthful imparts a dose of mellow sweetness, coupled with a pleasant crunch. 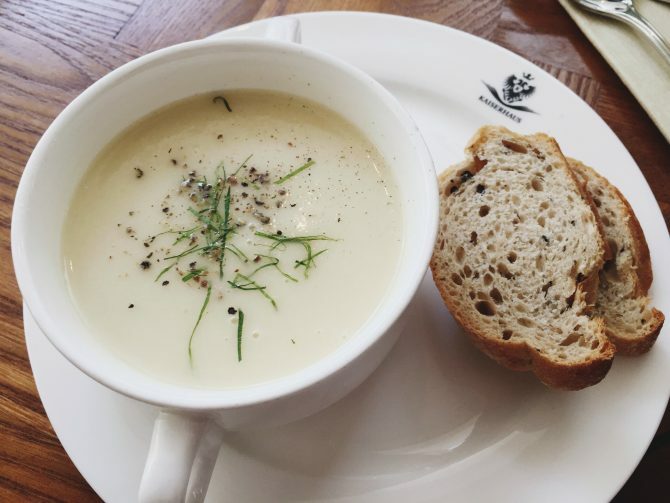 For a luxurious snack, go for the comforting Spargelcremesuppe (Cream of White Asparagus Soup, $12) with smoked ham. Smooth and creamy with a light smoky flavour, it paired well with the accompanying slices of olive bread. The Spargel mit Räucherforelle — smoked trout fillet served alongside white asparagus with potato salad and Béarnaise sauce. 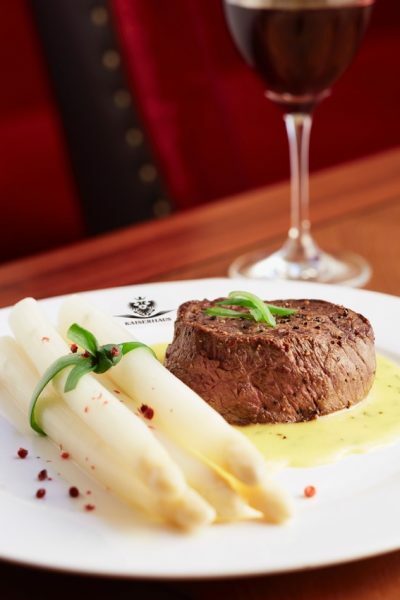 Lovers of good steak ought to give the Spargel mit Rinderfilet (White Asparagus with Beef Tenderloin, $42) a go. Cooked medium rare with a tender pink centre, the tenderloin was juicy and flavourful. Its richness was well balanced by the accompanying stalks of refreshing asparagus. If you’re in the mood, a pint of Hirter “Morchl” (dark lager) will seal the deal. 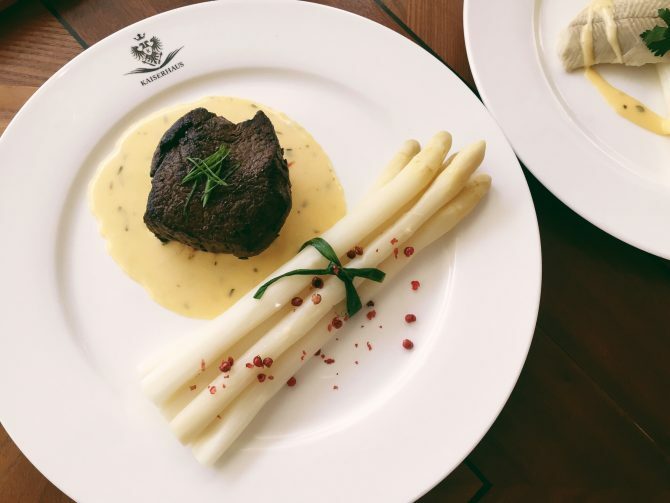 Lovers of good steak ought to give the Spargel mit Rinderfilet (White Asparagus with Beef Tenderloin) a go. The final two items on the menu are the Spargel mit Schweinefilet ($35) — featuring pork medallions wrapped in bacon, tender white asparagus and potatoes; and the Spargel mit Räucherforelle ($28) — smoked trout fillet served alongside white asparagus with potato salad and Béarnaise sauce. 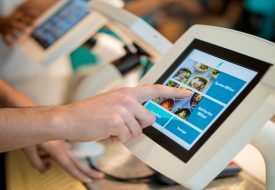 While the flavour combinations in the dishes were excellent, we recommend going easy on the Béarnaise sauce as it could potentially mask the legumes’ natural flavour.